The 24"x24"x24" 70 pound DR280 is just a bit larger than the DR250, a bit smaller than the DR300. Like all DRs the 280 was designed for vertical arraying, and has an 8 degree vertical splay angle built in. But if you're using DR280 on the backline for bass or keyboards that angle still comes in handy, tilting the cab back so you can hear it better. Prefer compression horns? 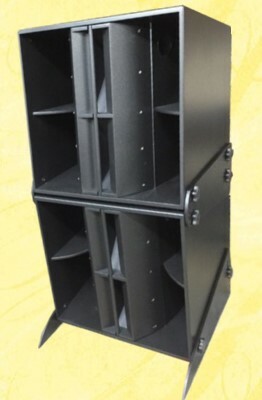 The DR280 can be built using the same dual compression horn vertical array as the DR300. 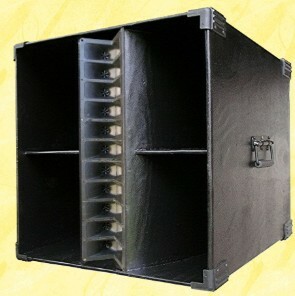 Shown here is a pair of compression horn DR280s stacked as a J-Array, using the ground stacking clamps shown in the plans. Equivalent Retail Value: DR280 $1699 to $2499 depending on driver choice. Plans are $ 14.95, delivered within 24 hours as email attachment in MS Word format. 42 pages, 63 photos, 12 diagrams. PDF version available on request.